People like to feel extra whether they do something on purpose or it happens accidentally. There are billions of people on this planet, and we guess that every individual is probably more or less extra. Depending on the way you look at certain things, it might actually be true. Everyone can be extra, because it takes a small effort to feel or look that way. This is why you should never settle for less than the best you are capable of. As much as we want to say that we don’t love junk food, we simply cannot say such a thing, because it is not true! Just like the majority of people, we love ordering fries, burgers, pizzas and everything else you could imagine. But there are people who love junk food even more than us! As you can see, one junk food lover invented something that looks beyond good! It looks dreamy! 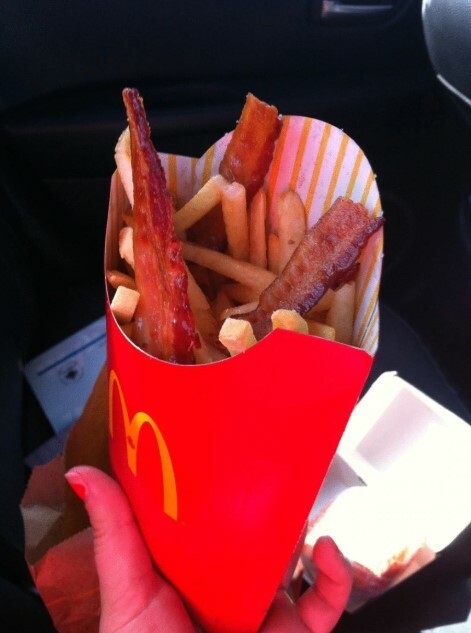 This is something that we are definitely going to try next time we have junk food cravings. Fans can go great lengths just to prove their love for an actor, a sports club or any other public figure or organization. However, in some cases the means to do that are more than controversial. As you can see, they are ridiculous! 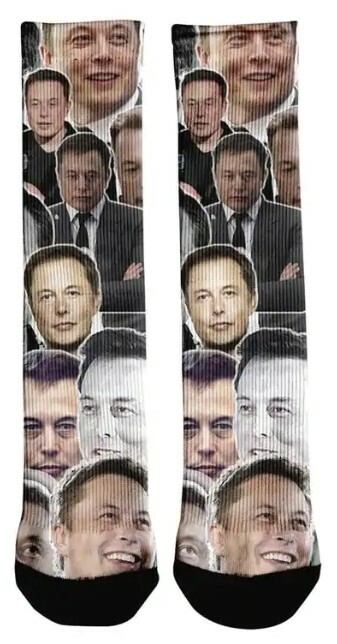 The photo shows Elon Musk-themed socks and we believe that we haven’t seen a weirder accessory in a while. Who in their right mind would wear those? Even if you like Musk, there is a variety of ways to demonstrate that. Wearing his face on your feet is not something that we consider to be okay. 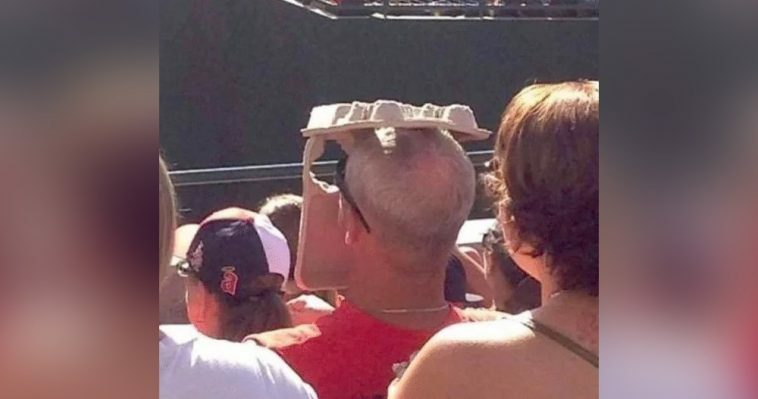 Well, no we have seen it all! 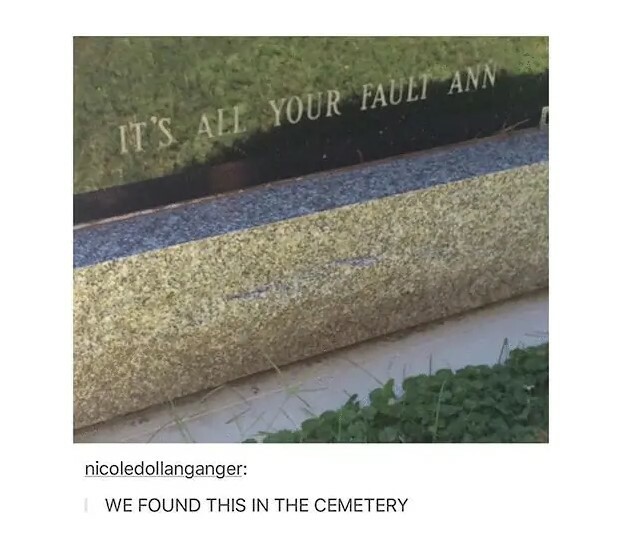 People can obviously send a message after they are dead! Of course, it took some planning and help, but it is the effort that counts! And this deceased person definitely made an extra effort here! He probably ordered that gravestone when he realized that the end was near. Some might say that it was nothing more than just twisted sense of humor, but even if this was the case here, it still counts as a special thing. We have been to Wendy’s a lot of times, but we have never encountered something like that. Of course, we are glad we never did, because we would be as freaked out as the person who posted the photo was. 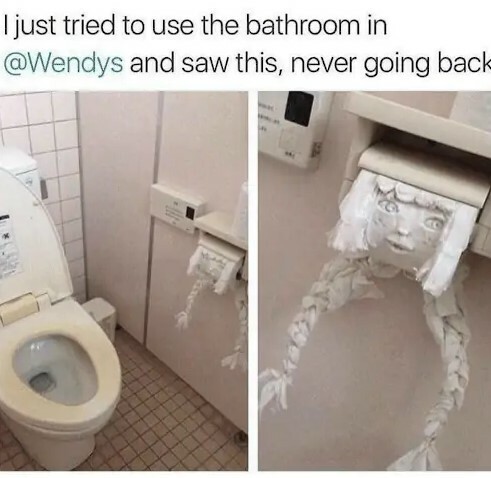 Just imagine how extra you need to be in order to spend a lot of time in the toilet of a diner and carve the toilet paper roll into a thing from your nightmares. This is definitely a unique situation, but we are glad we were not involved in it. It is no secret that the difference between boys and men is the size of their toys! Having that in mind, it is quite easy to see why men like to own cars, bikes and boats. Even more, they like to customize them and make them unique! This person did the same, but in the most unimaginable way! 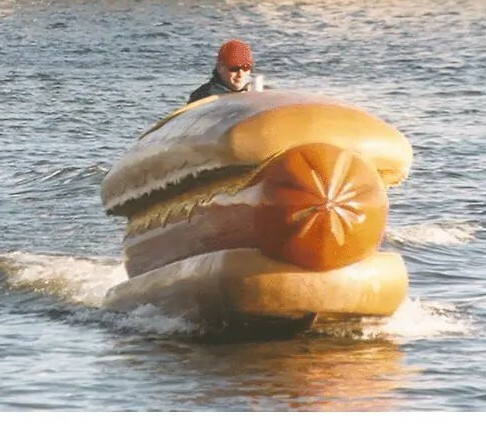 His hotdog-shaped boat is not something that you would expect to see. The man appears to be proud and he should be, because it looks very realistic. Vandalism is not something good for sure. We need to have zero tolerance for any kind of vandalism, because it affects society in a bad way. However, there are exceptions and the photo above shows one of them! 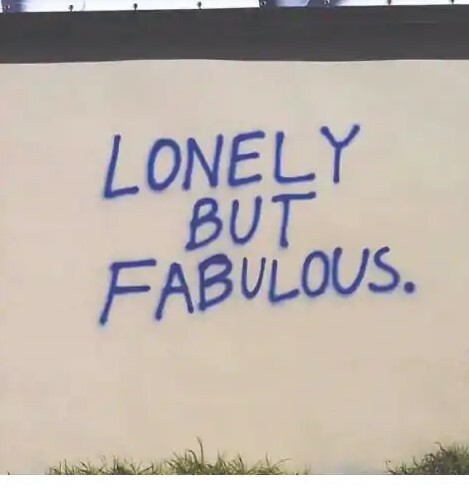 The simple sentence written on that wall was definitely written by someone special! Everyone who reads this one is probably going to smile from ear to ear. A lot of people would relate to it, too. We know we can! Restaurant owners are willing to do anything in order to impress their customers and to attract new ones. They rely mainly on the atmosphere and the decoration, but sometimes they bet everything on the presentation of the food. 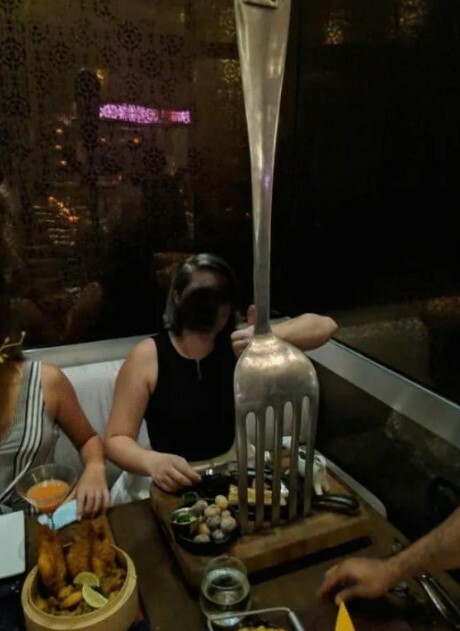 It is clear to see that the place from the picture decided to impress everyone with the most controversial way of serving food we have ever seen. People could easily get distracted and actually forget to eat. And we mean that quite literally! 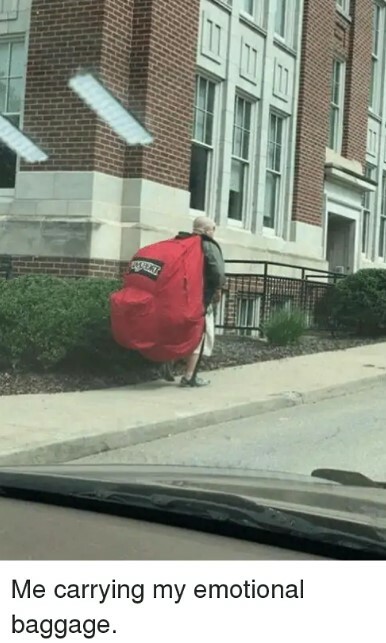 The photo shows the biggest backpack we have ever seen and we cannot believe that someone could actually carry that thing on their back! As you can see, it looks more like a tent than a backpack. We also love the way someone captioned this photo, which is relatable! Sometimes the emotions you stack inside yourself can burst like a bubble and that is not good. The moral of the story – do not stack your emotions and let them out instead. We guess that every time we open an internet browser, we dive in an endless pool of new things just waiting to be discovered. Just when we were convinced that we have seen it all, photos like these appear out of nowhere and we are left stunned! Imagine how extra you need to be in order to develop and produce a work helmet like that! It looks exactly like a cowboy hat even from a close distance! 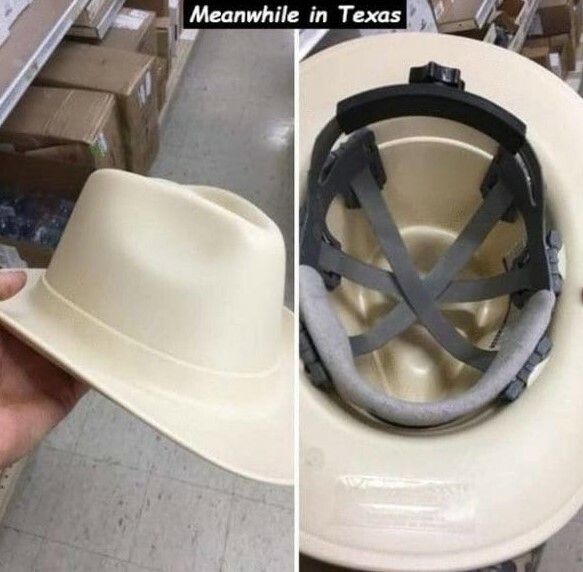 Of course, the photos were taken in Texas, which is the appropriate place for such an item to be sold. 10. Have you seen lavish trash before? 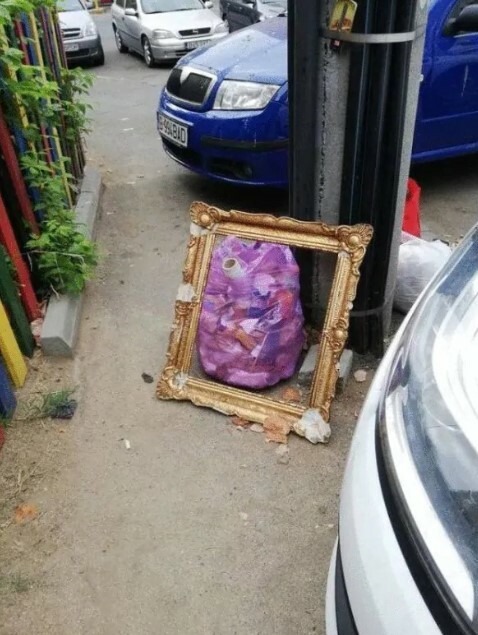 They say that one man’s trash is another man’s treasure! Well, this seems to be true! Photos like this one can serve as the perfect proof! This fancy frame was probably surrounding a mirror for a lot of decades before it was thrown out. We have no idea if it is valuable or not. The damage on it looks repairable but we have no idea if it is worth it. What is sure about it is that it looks really extra among the rest of the trash. This is one really curious photo! As you can see, this photo was taken thirteen years ago, but it features something really curious! As you can see, the kid in the far left is striking the most ridiculous pose which became a trend in 2018! It is a really weird coincidence and it looks too real to be true. Is there more to this photo than meets the eye? 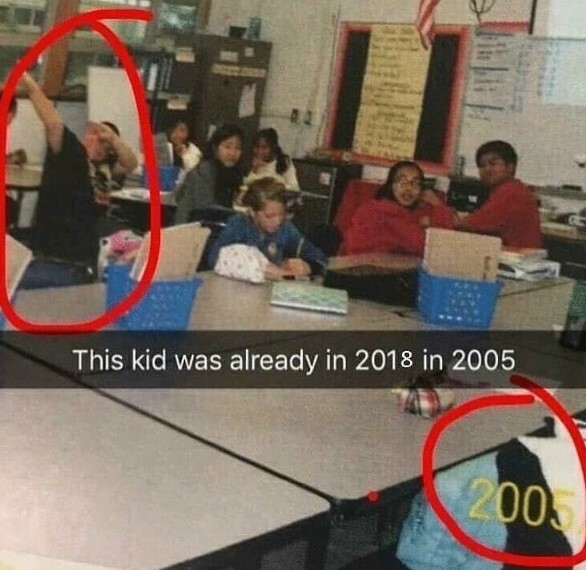 Could this be a time traveler photo? We would never know. People can do a whole lot of crazy things. 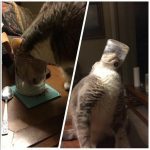 In some cases the other might think that it is a controversial behavior, but if a certain individual is really extra, they would not care at all. We guess that this is the best type of behavior. People need to keep their opinion for themselves! 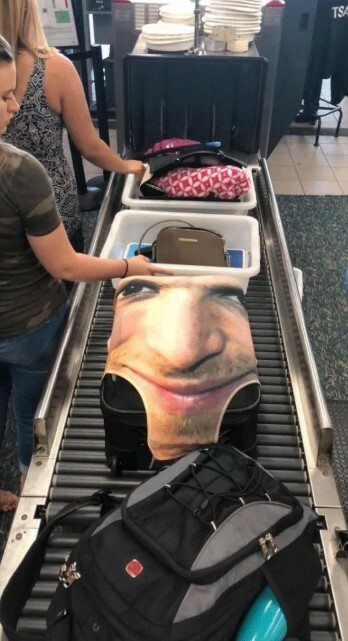 The person who was able to wrap his luggage like that is definitely someone special! This individual can be sure that his belongings can never be lost or taken by mistake. Bachelor and bachelorette parties are special events that need to be planned and organized with caution! The little details matter the most and the person who needs to organize the event must make sure that it will be unforgettable. This photo makes us think that this bride-to-be will remember her bachelorette party for as long as she lives! 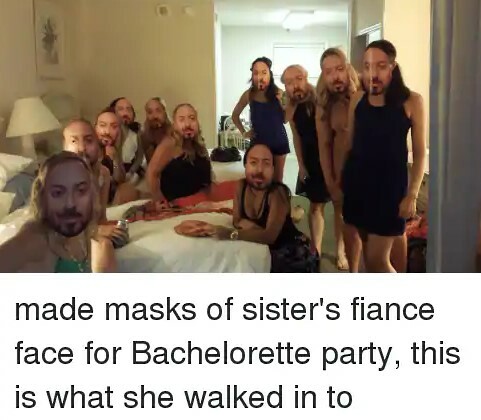 These masks turned the party into a gang meeting, but at least it was her fiancée’s face! We simply cannot stand insects! They are annoying, because they either fly in your face of bite you all the time, not to mention that some of them are potentially dangerous. Of course, there are exceptions and nature can really surprise us sometimes. 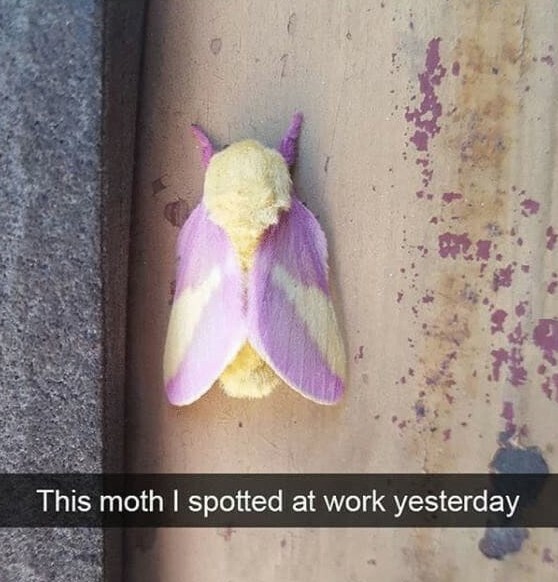 This moth is the perfect example! As you can see, its beautiful pastel colors give a look that can be considered as extra compared to other moths! We guess that most people would admire it when they spot one. Having the right attitude towards animals is visible from a far distance sometimes! 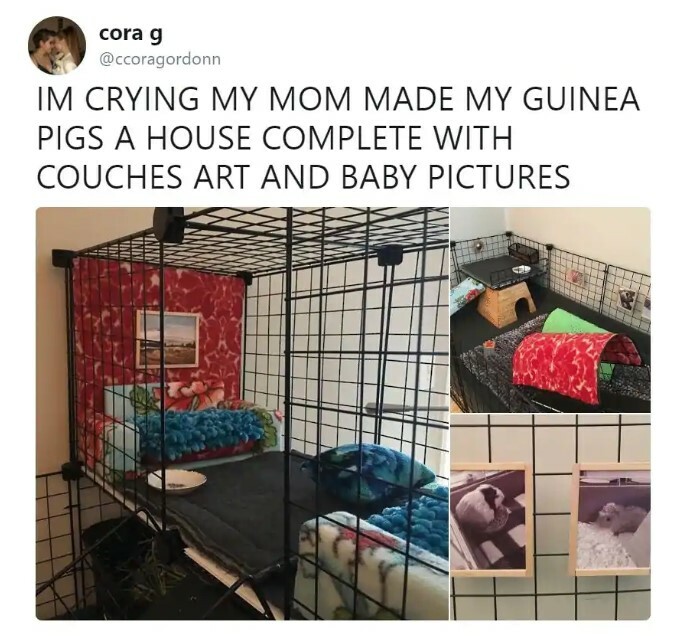 Just look at the extra effort a woman made in order to build a fully furnished tiny home for her daughter’s guinea pigs! The home has everything, including couches and pictures on the wall. We bet that the pigs felt that they got something really special, but the most important thing is that we got to see this amazing creation. 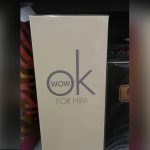 The woman definitely has skills!